Front holding page - do not edit. "Just what is so special about your Courthouse Museum?" is a question I often hear from people. It's a question that can't be answered with a few quick sentences. Our Courthouse Museum is the look of pride on the face of a widow of a WWII veteran as she looks at his picture, uniform, or medals. It's the beaming smiles of baby boomers as they share their tales about their fathers' lives and their mothers' lives during the war years. It is the the wistful looks on the faces of adults who bring pictures in for us to share and say, "I never knew my dad. I was just a baby when he died in the war." It's the awe-struck look on school children's faces as you tell them about the brave deeds of some of our veterans. It's the pride I feel as one boy says, "Wow! I hope I can grow up to be brave like him. He must have been a good man!" It is the voice of a veteran saying, "God bless you people for remembering us." It is the sound of families telling stories of their loved ones with pride even as tears roll down their faces. It is my feeling of pride when my cousin tells me that our Grandpa's railroad memorabilia needs to come home to Effingham. It is the look of little children's faces lighting up with excitement as they watch our trains go round and round. It's the sound of the train whistle eagerly made by a little one's hands. It is the excitement of voices saying thank you for telling our county's story. It's the nostalgic voices of people pointing to a picture or a model of a favorite hangout from their youth. It is the laughter of old friends who no longer live here meeting up and reminiscing about the "good old days" of their youth in Effingham. It is the shaking of heads as people look at the 800 pound log that was part of the National Road, and their statements of how tough it must have been to be a pioneer. It is the far-away look in people's eyes as they try to visualize what our county looked like when the first settlers came. 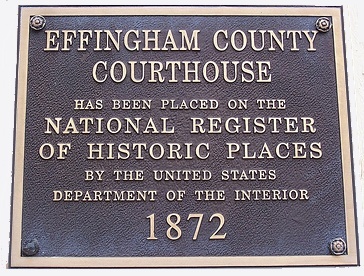 It is the look of pride when people discover Effingham County's connection to Abraham Lincoln. It is the stricken look on faces as they learn how so many died from Spanish Influenza in our county, state, and country during WWI. It is the look of love as people tell of their veteran's service in WWI. It is the tears that roll down my own face as I print out a picture that shows two Effingham County sailors from WWII standing at the grave of their friend on the island of Okinawa so far from home. It is all this and so much more that makes our museum special. It is our history. It is our past, our present, and our future. Give us a chance to share these stories with you. Come in and share the stories of your family with us. 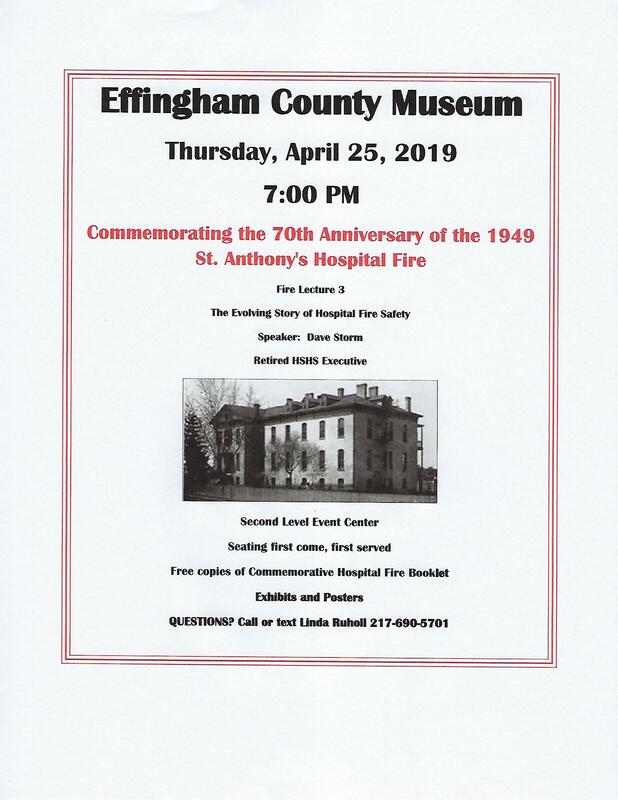 Let us add your pictures, stories, and artifacts so that your story will become a part of the patchwork quilt of memories that is being woven by the people of Effingham County. Come and be a part of what is happening at the Courthouse Museum. I think you will like what you see. Yes, I really think you will like what you see. Come join us for the third and final fire lecture. 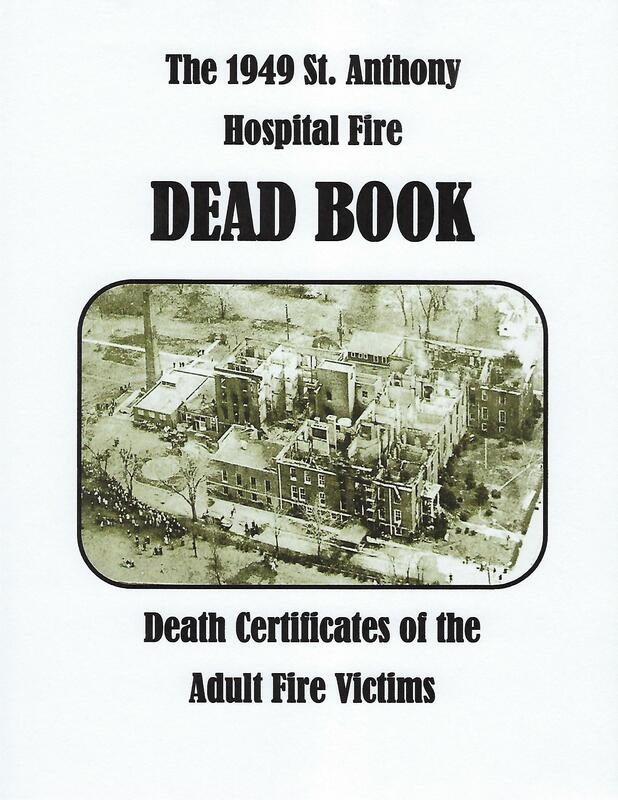 Dave Storm will explain how the 1949 hospital fire got started and how fire safety improved afterwards. Click the link to download the flyer. 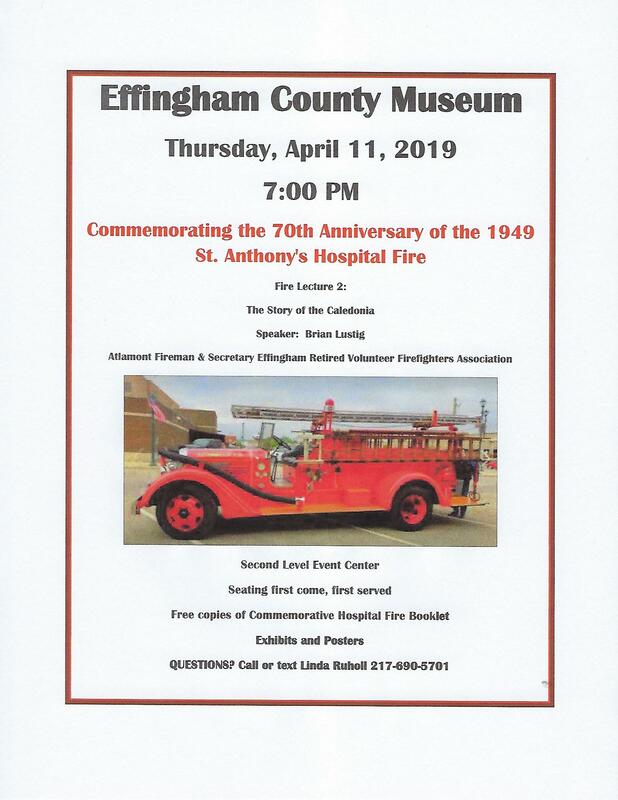 Join us this week for the second of our three St. Anthony Hospital Fire of 1949 commemorative lectures. Click the link below to download and print the flyer. Read about upcoming programs and the Museum's new exhibits. Click the link below to read or download the lastest issue.